Healthy options are much more in demand today than in previous years. Nutrition is a fairly new science and explodes as new research is concluded and we see this in the market. We work with hundreds of students on their special diet needs and that grows yearly. Chef DeWayne McMurrey started his career at several casinos in Montana in 1996 and continued pursuits in the hospitality industry. He graduated in the top ten percent of his class at the Culinary Institute of America in Hyde Park, New York. During this time, he interned at the Dallas Country Club under Certified Master Executive Chef, Ernst Gruch. Chef McMurrey arrived at Texas Tech in 2005 and has strived to make this campus lead the rest of the nation in university food service. Apprentice at the Dallas Country Club under the instruction of Certified Master Chef Ernst Gruch. Graduated from The Culinary Institute of America, Hyde Park, NY. Multiple chain restaurants, cafes, hotel, and country club experience. On March 19, 2008, Executive Sous Chef, DeWayne McMurrey, entered the NACUFS (The National Association of College & University Food Services) Regional Culinary Challenge in Athens, GA. DeWayne prepared the Seared Striped Sea Bass with Apple Buerre Blanc and won a bronze medal. 2010 NACUFS Culinary Challenge Southern Regional Silver medal winner. Prepared the portobello and spinach roulade with wild mushroom risotto and tournee carrots. 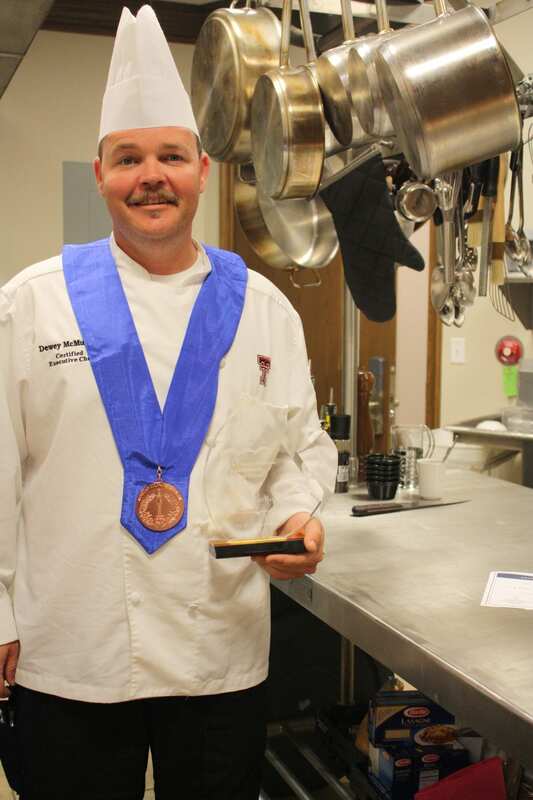 2010 NACUFS Culinary Challenge National Bronze medal winner. Chocolate Fantasia 2005 – 2010, 1gold , 3 silver, and a bronze medal. Cooking Demonstrations for Students and Staff 2005 – present. Chef of the Year Panhandle Chef de Cuisine / Regional Chef of the Year Competitor 4/2012. I picked the chicken because it is a very popular on our catering menu being ordered almost daily as well as being a perfect fit for spring and summer menus. It is a spin on a traditional dish. The slaw is very popular side item especially in the fall and cooler months but is pretty flexible as a side item. I created that recipe for my Certified Executive Chef exam and sold it on a menu once and it is still here. It is well balanced and delicious. The Mac & Cheese is an old standard for almost anyone but there have been revolts when units have tried to change this recipe to something else, so I thought it would be fun to share. I would say about 15% to 25%. But this is something we are constantly looking to increase and make more available. At the same time we are transitioning from generation to generation. Healthy options are much more in demand today than in previous years. Nutrition is a fairly new science and explodes as new research is concluded and we see this in the market. We work with hundreds of students on their special diet needs and that grows yearly. You may even catch us doing special events at the Rec center and interdepartmentally sharing healthy cooking demos and information handouts. The most influential chef and mentor I had on my road to culinary success is Rocky Rockwell CEC. Rocky was a big inspiration for me to go to school and really prepped me to become better. He is still today a great friend and someone I respect. I enjoy the variety and competitive nature of working every day. That daily challenge to accomplish what needs to be done, and to make the most of it, and to watch the enjoyment of others through the care and love you put into your work. 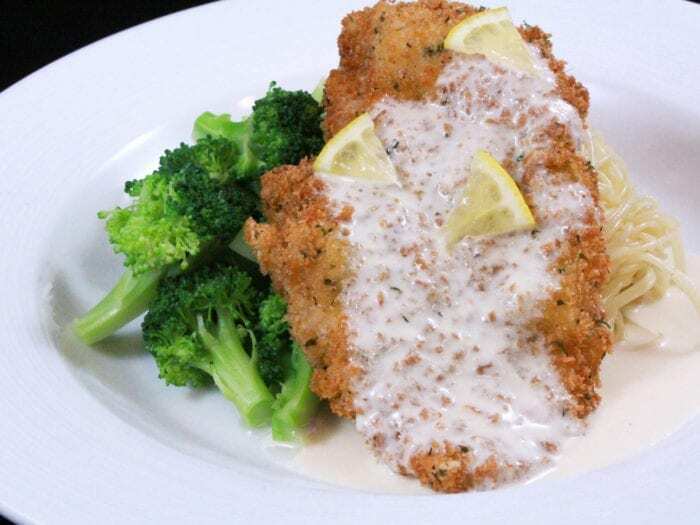 Panko ChickenI picked the chicken because it is a very popular on our catering menu being ordered almost daily as well as being a perfect fit for spring and summer menus. It is a spin on a traditional dish. 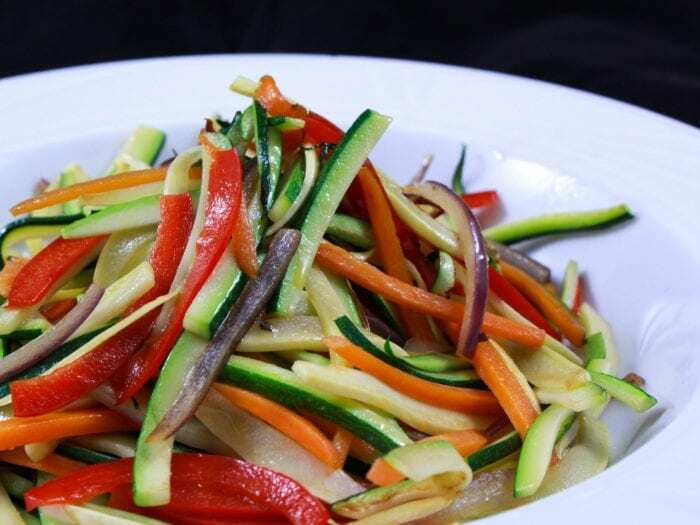 Vegetable SlawThe slaw is very popular side item especially in the fall and cooler months but is pretty flexible as a side item. I created that recipe for my Certified Executive Chef exam and sold it on a menu once and it is still here. It is well balanced and delicious.